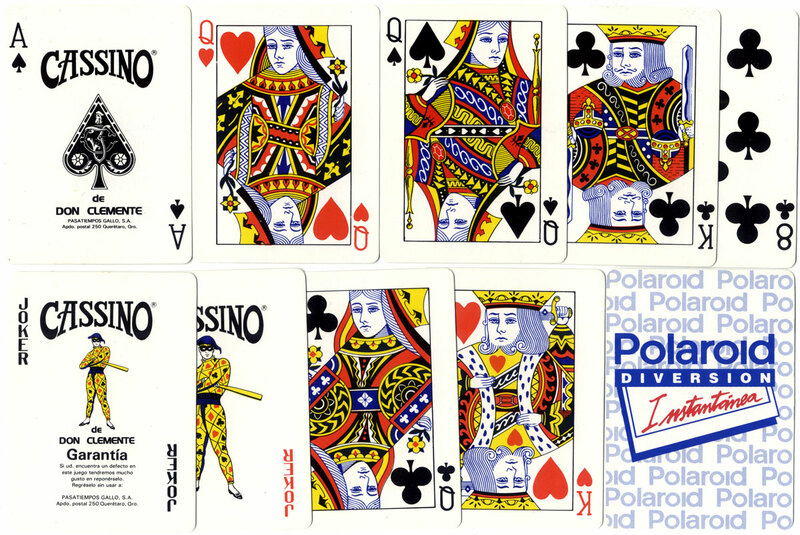 The Ace of Spades and one of the two Jokers gives the manufacturer's name and address as: Pasatiempos Gallo S.A., Apdo. postal 250, Querétaro, Mexico. The reverse features an advertisement for Polaroid copying. 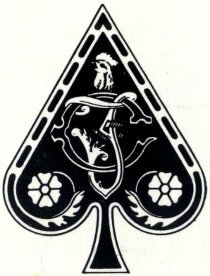 Right: The Ace of Spades has a cockerel's head and the initials CJ incorporated into the design, which refers to the original manufacturer's name, Clemente Jacques and the Gallo trademark which was acquired by Don Clemente in 1982. Standard Anglo-American packs such as the example shown here were produced by Clemente Jacques y Cia since at the least the 1950s, often with pictorial back designs, and then by Pasatiempos Gallo S.A. since c.1975. Only slight design details have changed over the years on the Ace of Spades. The court card designs are loosely copied from those published by the U.S. Playing Card Co. If you would like to contribute images of Latin American playing cards to this website please use the 'Feedback & Enquiries' form in the footer below.